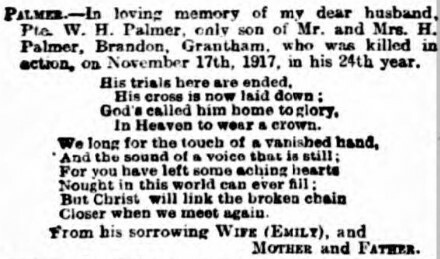 Henry and Jane Palmer were both from Gosberton (between Boston and Spalding) but Henry was a farm foreman and seems to have moved around. Their only son, William Henry was born in Brandon in 1895. His sister died in Brandon 2 years later, age 7. By 1901 the family were back in Gosberton and in 1911 they were at Normanton Hill (near Carlton Scroop) where William Henry (16) was working as a waggoner. They then moved back to Brandon. William Henry joined the Army in Jan 1915 and after training and a period in Ireland he was sent to France in May 16. On 19 Apr 1917 he married Emily Toulson at Beeston, nr Nottingham. He died on 17 Nov 1917 while serving with 2nd Battalion, Welsh Regiment. A month before he died the battalion had been reinforced and moved to Ypres in Flanders, from where it took part in the final attacks on Passchendaele, the last part of the 3rd Battle of Ypres. 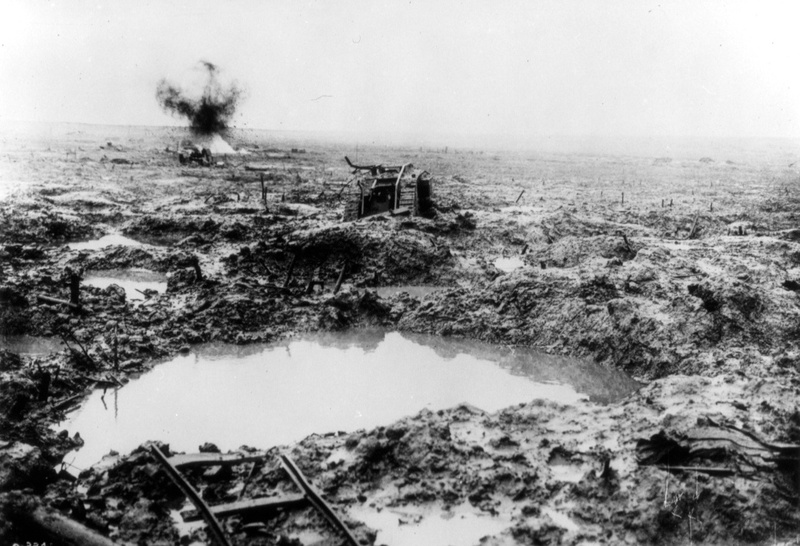 Continuous rain had converted the ground into sea of mud and shell holes. The only method of getting near the front line was by marching in single file along the duckboard paths which zig-zagged between the shell holes. These paths were continually swept by shell fire and often by machine gun fire from low-flying aeroplanes. The front and support lines consisted of a series of disconnected shell holes and the only communication was by runner. After launching an attack on 10th Nov their objective was eventually taken and on 15th Nov the battalion occupied Vat Cottage Ridge – another line of shell holes – where they were shelled until being relieved on the night of 17th Nov. So it seems likely that William was killed by shellfire on their final day in the front line at Passchendaele. His body was not found but he is remembered on the Tyne Cot Memorial. His parents left Brandon in 1922 and moved back to Gosberton, where Jane died in 1938. William Henry’s widow Emily re-married to Edwin Walker and moved to Welbourn.